The friends with whom I'm going to Burning Man have an email thread, for coordinating logistics. 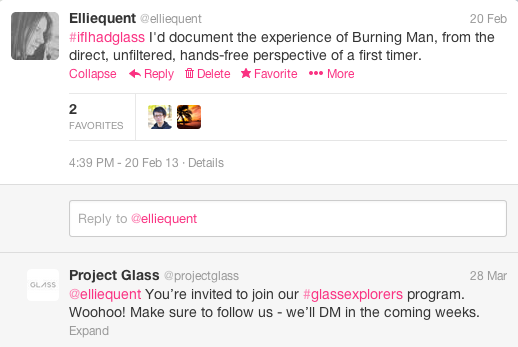 Last month, someone sent through a link to Google's Project Glass, saying "Someone please apply for this. Imagine having it at Burning Man!" Immediately, a couple people piped up that documentation of any kind runs completely contrary to the spirit of the festival. Heated words were exchanged. I got the reply tweet while I was at the UofA game, and I was beside myself excited, because I didn't realize that so many people received invitations, or that I'd still have to pay $1500 if I want to buy Glass. There's also the fact that my pitch - using it at Burning Man - isn't even feasible anyway, since there's no cellular coverage or wifi on the playa. Plus, my friends are right about documentation, and I don't know that I'd want to even mess with something like Glass when I'm there; I plan on being pretty busy with other things (not to mention, it would get absolutely trashed in the desert).